A new study published in the Journal of Archaeological Science shows that humans who lived during the Middle Pleistocene (781,000 to 126,000 years ago) were highly adaptable and capable of exploiting a wide range of prey, including wild cattle, horses, duck, and even rhinoceros. Researchers have known for decades that humans and other early two-legged hominins had been making tools to kill and butcher animals for as long as 2.5 million years ago. 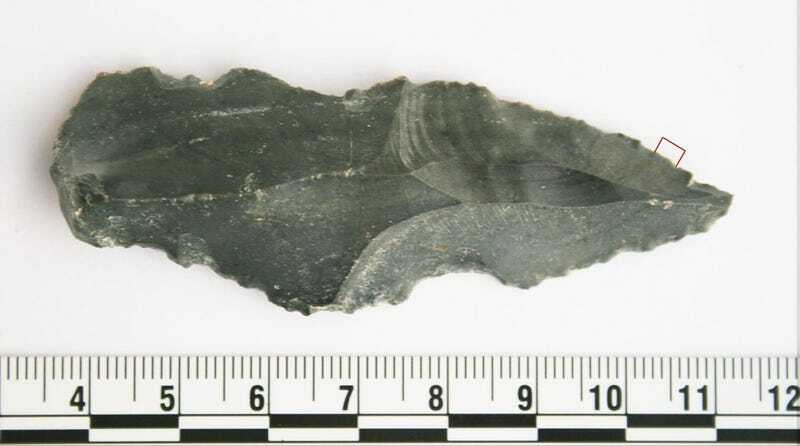 But now, for the first time ever, a research team led by April Nowell from the University of Victoria has discovered direct evidence pointing to the exact species of animals these early humans were hunting and consuming. The artifacts found at the Azraq site contain the oldest evidence of protein residue ever found on stone tools. Prior to this study, the oldest animal residue found on stone tools was dated at 11,500 years ago. Nowell’s team, which included members from universities in the United States and Jordan, excavated 10,000 stone tools at the site, in what is today an arid desert. Hundreds of thousands of years ago, during the Middle Pleistocene, it was the site of a wetlands, a veritable oasis for a group of proto-humans who pre-dated Homo sapiens in Africa by thousands of years. Of these tools, 7,000 were carefully examined, including scrapers, flakes, projectile points, and hand axes. Seventeen of these implements still contained traces of protein residue, including blood and other animal products. The origin of this residue, which was found in the little fissures and crevasses of the tools, were confirmed through a matching process involving animal antibodies. Analysis revealed the identity of the butchered animals, a list that includes horse, wild cattle, duck, and rhinoceros. Based on this evidence, it’s clear that the ancient humans who lived in this demanding habitat were highly adaptable and capable of taking advantage of a wide range of available prey. But as to how they were able to take down a rhino, or process its tough-as-nails carcass, the researchers admit they’re dumbfounded. “What this tells us about their lives and complex strategies for survival, such as the highly variable techniques for prey exploitation, as well as predator avoidance and protection of carcasses for food, significantly diverges from what we might expect from this extinct species,” noted Nowell in a release. Excitingly, the same technique developed by Newell and her colleagues could be used by other researchers to study other stone implements, including those that are significantly older. Archaeologists could learn about the dietary habits of ancient hominids who lived even longer ago.